Composer, performer, teacher, and theorist Elizabeth Erickson enjoys blending musical styles and bringing her music to unusual places. She grew up in Milwaukee, Wisconsin, began her professional studies at the College of Wooster in Wooster, Ohio, and continued them at the Longy School of Music in Cambridge, Massachusetts, where she received the Undergraduate Diploma and the Masters of Music, both in composition. She regularly attends workshops in Dalcroze Eurythmics and is a certified Musikgarten teacher. Elizabeth's teachers include violinist/violist Laura Bossert, violist Jennifer Allman, cellists Terry King, Tom Kraines, Ravenna Helson, and Jane Hollander, pianists Marilyn Thompson, Rieko Aizawa, and Bernice Smaida, and composer-theorists Peter Aldins, Paul Brust, John Morrison, Jack Gallagher, Peter Evans, Judith Ross, Peter Mowrey, and Jack Russell. In addition, Elizabeth has studied chamber coaching with Wayman Chin, string pedagogy with Clayton Hoener, jazz improvisation on piano and cello with Peter Cassino, Musikgarten with Cathy Mathia, and Dalcroze Eurythmics with Lisa Parker, Adriana Ausch, Anne Farber, Ginny Latts, Louise Mathieu, Dawn Pratson, Melissa Tucker, and Jeremy Dittus. Elizabeth has been teaching for nearly two decades and accepts as students both children and adults of all levels, backgrounds, and interests. She believes firmly in the importance of music education for families of all income levels and gladly provides scholarships and opportunities for barter. Elizabeth has been playing piano for thirty-one years, cello for twenty-five years, and violin and viola for sixteen years both solo and in a variety of ensembles, including gigging and competition-winning string trios and quartets, audition-based symphony orchestras, and musical theatre pit orchestras. She has been playing the recorder for twenty-nine years, guitar for twenty-two years, electric bass for thirteen years, and occasionally picks up the mandolin and the ukulele. Elizabeth performs her own new music as well as that of other modern composers and plays, composes, and arranges for weddings and other events. 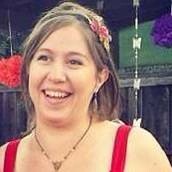 She is director of Born Singing and music advisor and bedside singer with Sonoma County Threshold Choir. She plays folk-rock with Nils Erickson as a duo and with their family band, The Kerfuffalos, and both performs and records with other bands and songwriters. She volunteers as a musician at Kaiser Permanente in Santa Rosa. Elizabeth is based in Santa Rosa and is available for weddings, special events, gigs, and recordings throughout the San Francisco area. Elizabeth's interest in teaching and learning was inherited from her mother, a Montessori teacher, and raising her own children is endlessly deepening her understanding of the learning process and honing her approach to students of all ages. When she is not making music or wrangling children she can be found reading, writing, knitting, practicing yoga, Irish dancing, or finding more ways to squeeze a farm into a residential lot.